Ada Lovelace day occurs every year on the second Tuesday of October and is an international celebration of women in science, technology, engineering and mathematics (STEM). 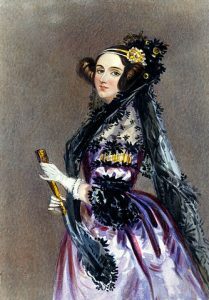 The occasion is inspired by the work of Ada Lovelace, a Victorian aristocrat and the woman credited with publishing the first computer program. This year we are honouring the day by examining her important contribution to modern computing. Ada Lovelace was born in 1815, the only legitimate child of Lord Byron and Anne Isabella “Annabella” Milbanke. Her parentage was one of contrasting forces, with Byron a tempestuous romantic poet and Annabella an eager amateur mathematician, nicknamed by her husband as the “Princess of Parallelograms”. After the acrimonious separation of her parents, Ada was encouraged by her mother to concentrate her efforts on learning mathematics and science, as a way of preventing any inheritance of her father’s creative leanings and madness (1). She soon outgrew her mother’s choice of conservative tutors, including a mathematician who did not believe in negative numbers! Though her imagination was suppressed from an early age, it would nonetheless allow her to conceive the full potential of computational machines. Her introduction to the concept of computing came through a meeting with Charles Babbage, the inventor of the first mechanical machine capable of a specific type of calculation, when she was only eighteen. Their early discussions about mathematical puzzles would develop into a lifelong friendship and intellectual partnership. Babbage was an impressive eccentric even by Victorian standards: he despised street music, campaigned against children hoop-rolling and famously ranted at the Prime Minister Robert Peel over the funding of his inventions (2). His early design, named the ‘Difference Engine’, was essentially a calculator designed to tabulate polynomial functions with number values represented by gear wheels. The Government funded the project in the hopes of devising a more economical method for producing tables. However, the project soon stalled in development, which provided Babbage with time to increase his ambition. In 1834, he conceived the ‘Analytical Engine’, a mechanical and general-purpose computer that would be programmable through punched cards. The concept was inspired by the Jacquard loom, which used punch cards to input weave patterns. The Government, however, was less interested in this design, desiring only a new method of producing tables. Despite this, the Analytical Engine incorporates all of the essential components of modern computers, including a memory store and processor. Without funding, both designs languished as abstract ideas. The Difference Engine was finally built by scientists at the Science Museum, London in 1991, with the printing mechanism completed in 2000. Ada became fascinated by the Difference Engine prototype the instant she saw it and went on to work with Babbage on the Analytical Engine concept. She understood the potential of computing far more than Babbage; their individual contributions can be split into his development of the hardware and her concentration on potential software. Ada was the first to realise that a general computing machine had the potential to manipulate any type of information. Her published notes describe important rudiments of computing, including instruction loops and the separation of software from hardware. Many consider her to be the first computer programmer as she wrote a detailed description of how the Analytical Engine could be instructed to calculate Bernoulli numbers (the complex series of numbers that arise from expansions of trigonometric functions) (3). There has been much academic discussion evaluating the extent of her contributions. This is due to reported evidence of Babbage having written un-published rudimentary algorithms for the Analytical Engine before Lovelace’s notes. Nonetheless, her notes with instructions for programming the machine to calculate Bernoulli numbers are the most elaborate and complete of the draft programs for the Analytical Engine, alongside being the first to be published. Doron Swade, the senior curator of the Science Museum who was in charge of constructing the Difference Engine, has helped define her important contribution. He states that she was undeniably the first to publish a computer program and also understand the potential of computers to calculate various entities rather than being limited to quantities (4). Ada died in 1852 at the age of 36, cutting short her work on the Analytical Engine. Her efforts came to public attention in 1950 when Alan Turing discussed her notes in his seminal essay on artificial intelligence. Today her contribution is acknowledged throughout the field of computer science, including the British Computer Society Lovelace Medal given to individuals who have advanced computing (5). Ada Lovelace Day was developed as a way of highlighting the work of women in STEM. Research has shown that although many girls are successful at science subjects in school, only a smaller number go on to study these subjects at university or work in STEM-related fields (6). Visible female role models are an important tool for inspiring the next generation of women to become engineers, inventors and scientists. Ada Lovelace remains an inspirational figure and her day also helps shine a spotlight on the many other women who are unsung heroines of science. Polynomial: A mathematical expression that includes both constants and variables using four operations (adding, subtraction, multiplication and non-negative integer exponents of variables) (7). Jacquard loom: A type of automatic loom that would produce complex patterns in textiles. 6. The Guardian: Bridging the gender gap: why do so few girls study stem subjects?